The application form is available on the official website. Interested applicants have to apply themselves for the same after checking the eligibility criteria. The candidates have to pay an application fee of INR 1200/- at the end of filling up of application. Based on the marks obtained in High secondary examination and common entrance exam, the students will be shortlisted for admission process in various courses. Candidates who passed in 10+2 examination with at least 45% marks in PCM can join the course B.Tech in St. Andrews Institute of Technology and Management admissions 2019. Candidates must have passed class 12th examination with Physics, Chemistry, and Mathematics with a minimum of 45% marks to join the BBA course in St. Andrews Institute, Gurgaon. The eligibility criteria for a student to join BCA course in SAITM, Gurgaon for 2019 admissions is to have a minimum of 45% in PCM in 10+2. My answer to this question is simple, it was the closest college to my home, they had the courses I needed, the accredited program I desired, and the ability to get my degree. lot of class seniors study here and all have given good remarks for the college thats why i choose andrews. The eligibility criteria for BBA (I.e., Bachelor of business administration) is 12th pass out from any background like science, commerce or arts any field with having 60-70% marks in 12th to take admission in BBA. A college entrance exam held in college by which you can take admission easily, In that exam if you score more than 60% students can get up to 10% off in there yearly fees. If any student want to have admission in St. Andrews Institute of Technology and Management, Gurgaon then they will have to face enterence exam or otherwise if student's have good percentage in 12th class, they may get admission here. A written entrance exam is being held in every parts of the entire country. If students will get above 60% as the cut off, they they may be able to get admission in this college. The Wi-Fi facility is good all over the campus. The library has a good collection of various books. The campus has a hospital that provides free check-up to students. Various sports events are organised in the college. There are a few indoor games too. The classrooms are good, but the labs are outdated with a very few modern machines. The hostel rooms are rather small but satisfactory and the quality of food is decent. The college is very good with all the great infrastructural facilities. The campus life is also very good. The labs are equipped with all the latest instruments. The faculty members are very experienced and dedicated. One of the best college that should be given a five stars rating as it provides the students best education with other facilities like wifi, highly equipped labs. College also has a gym for students. The eligibility criteria are 45% in Class 12. Counseling session was given by faculty. I opted for this college because this college which provides the opportunity to study a different course designed and is certified. This college also provides a chance to explore my individual capabilities. My acquaintances also provided a positive feedback so I opted this college. The general eligibility criteria to be eligible for applying for BCA course is one must have completed his/her Higher Secondary (+2) Examination or equivalent(diploma degree), with minimum 50% marks in total and also included Mathematics as the subject in the qualifying examination. And admission procedure is very simple of my college anyone can take admission. Its one of the top best college in Delhi Ncr. Great environment surrounded around 4.2 acres. Facilities are highly professional and supportive towards achieving our goals. Our college is a growing college as its motive is to excel, enthuse, and empower. I chose St. Andrews Institute of technology and management gurugram because it is very close to my house so I don’t have to worry about commuting very far and pay for rent. Also the infratsructure and education is very good and affordable. I got admission directly there, based on the marks of my 12th Board. I got scholarships based on my 12th grades which were provided as the deduction of my course fees. As per now onwards one has to qualify JEE MAIN entrance exam to get the admission. Later on, the college has started its own entrance exam. The course taught in the college is very helpful for all students and plus they taught various other factors for the course as well to incorporate those in our day to day life as well as in the corporate world. I filled up application form online & was given a date for the counselling session, i took counselling, all my queries were settled. i checked up the hostel and other facilities which were upto mark. i finally took admission on the basis of my marks and procedure was very friendly and easy. The college provides the best to the students in terms of academics activities and everything. College is diverse. There's much more to explore everday. It provides a lot of exposure in every field. The eligibility criteria are that you must have got 45% in 12th to get admission in St. Andrews Institute. I gave SAJEE i.e st. Andrews joint examination before taking admission here and even I got a scholarship. • I was pursuing the BCA course at St. Andrews Institute for which the eligibility criteria was 12th pass with any stream having more than 40% marks . St. Andrews Institute of technology and management is a best choice for gaining knowledge and here you can show your other talents also like dance sports singing etc. College management system is good ,but can be better.The new college campus will lead to more scope for students so overall it is good experience in this college. The admission procedure is Merit based. The eligibility criteris is above 45% in 12th class. Entrance test given in the college campus. Counseling session was given by the college faculty. There was an interview process to get into my college. I chose BCA, as it is useful to my career. I am interested to get some knowledge about technical skills. The eligibility criteria are to pass 12th-grade with 45% or above. There is an entrance exam conducted by St. Andrews Institute of Technology and Management, Gurgaon. To get admission in St. Andrews Institute of Technology and Management the student has to pass the 12th standard with 45%. Students have to write SAJEE exam to get admission in college. We have to give an entrance exam in which if we are able to hold a rank in top 50 we get a scholarship. It is a national scholarship exam(SAJEE) and we have to get at least 45% in 12th to get admission. At first, we have to give an entrance exam (SAJEE) and if we get good marks than scholarship is provided according to marks and merit. Even I scored good marks in that entrance exam and also got a scholarship. Eligibility criteria for joining the St. Andrews Institute of Technology and Management, Gurgaon is passing the 12th standard with 45% and passing the national scholarship entrance exam. In order to pursue B.tech from St Andrews college, you need to qualify SAITYM JEE exam, the admissions are provided on the suitable basis of class 12 marks and performance, scholarships are also provided for the same. I got admission in this college with the entrance exam. I cleared the exam called SAJEE which was held on the campus itself. After writing the exam, I got a scholarship on the basis of the entrance result. One Should have 45% in PCM in 12th Board (40% for SC Candidate) from the recognized Board. Students have to write and qualify the JEE MAIN entrance exam to enroll their names in this college. 60% Marks in PCM and attempt JEE Exam. For Direct admission, a student has to give SAJEE (St. Andrews Joint Entrance Exam). If a student gets Rank Under 1000 in SAJEE can easily take Admission in SAITM. The infrastructure of college is very well built. It's total air conditioning. Here faculties have a great experience and teach students in a frank manner. If anyone wants admission then contact me. Students can apply for entrance exam for admission in the college and after that merit list is made and best scorers are given admission. Personal interviews are also taken. The eligibility criteria are to score 45% or above in 12th-grade. The entrance exam conducted is the SAJEE exam. The eligibility criteria for my course was that I should have at least 60% in overall subjects of my 12th board examination. There was an offline test named SAJIIE taken at the time of admission. The eligibility criteria was that we have to pass intermediate with 45% marks in physics, chemistry and mathematics. There was one entrance exam which is the SAJEE. There are no typical cutoffs. The eligibility criteria for admission is based on 12th marks and also JEE MAIN marks. Our Institute also conducts SAJEE exam for scholarship and cutoff is based on only SAJEE marks. The quality of teaching is good in St. Andrews Institute of Technology and Management, Gurgaon. The college has excellent infrastructure. It is well equipped with labs. It has excellent and experienced faculty and has good industry exposure. The college well-equipped lab, friendly and helpful faculty. It is an excellent place to study and gain knowledge. Courses offered by the St. Andrews Institute of Technology and Management, Gurgaon for students is BBA, BCA, B.TECH. The eligibility criteria to join St. Andrews Institute of Technology and Management, Gurgaon is 45% or above in 12th standard and passing the SAJEE exam. The eligibility criteria is 45% in 12th class. if the student got above 60% in 12th so they are getting scholarship up to 90%, there is no entrance exam in college. The entrance exam is quite easy.To be eligible for admission one should have 40% marks in 12th and should score a minimum of 40% marks in entrance exam. My course criteria are ₹ 54000(INR) per year and the eligibility criteria are 60%. I have done a scholarship exam while getting admission in this college. After 12 you can take admission in this college. I have given entrance examination for engineering as well as a doctor. We need at least 120 for general. I got just pass out from st. andrews my admission procedure was by SAJEE test, after that SAJEE test I was eligible to take admission in this college. The candidate must clear the specific entrance exam and must have passed the 12th from a recognized institute. Minimum 50% cutoff mark is required. One has to qualify for JEE MAIN entrance exam to get the admission. It's very competitive and the cut-off was really high. The candidate must clear the JEE MAIN exam and must have passed the 12th from a recognized institute. Minimum 55% cutoff mark is required. There is no entrance test in college for admission, admission will be taken on the basic 12th marks after that counselling will be held. The eligibility criteria is to have the BTech(CSE) degree. The typical cutoff is 70%. Good marks in 12th. And also gave JEE MAIN exam for the admission and other types of entrance exam which is related to your course. Candidate must clear the JEE MAIN exam and must have passed the 12th from a recognized institute to get admission in this college. The student must pass the 12th-grade with good percentage and JEE Main id the entrance exam to get the admission in this college. Students should have 50% aggregate in PCM in 12th Board and have to write SAJEE entrance exam to qualify for admission. A student should have passed his/her 12th Board. A student also has to write common entrance exam to qualify for the admission. The student must pass 12th grade with the good percentage to get the admission in this college. The cutoff is around 55%. There is an entrance exam. Candidate must be pass in 12th from recognized board. And good rank is also needed. It's very simple and easy to take admission and college is good and the environment is very good at the Delhi camps. The candidate must be qualified 10+2 or diplomatic course. The candidate must carry 50% marks in the eligible course. You to qualify an entrance exam called SAJEE conducted by the college. JEE MAIN scores are also acceptable. 10+2, 55% minimum. College takes entrance exam SAITMJEE every year. 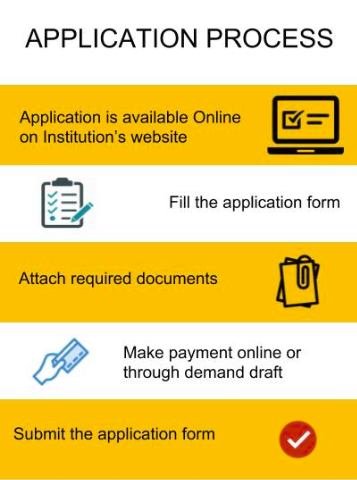 You can get the scholarship based on SAITMJEE. Minimum 60% marks in PCM SAITJEE is the exam I took for the entrance exam and 60% is the typical cutoff. The students must pass 12th with good marks and have to clear JEE MAIN and the cutoff is 81. The candidate must clear the JEE MAIN exam and must have passed the 12th from a recognized institute. The eligibility criteria and admission procedure for our course are JEE MAIN and 60% in class 12th. The student must pass the 12th-grade with the good percentage to get the admission in this college. The eligibilty criteria is to pass 12th board with minimum 60% marks and clear the entrance exam. You must have qualified 10+2 from a recognized board with PCM as compulsory subjects. Poor, even with minimum marks in his or her academics one can get admission in this college. 12th was the eligibility and the exam was online whereas the cutoff was 72% for mechanical. The best college in Gurgaon with the highest degree of labs, faculty members, and support. A student has to qualify JEE MAIN entrance exam to get admission in this college. The students must pass their 12th boards with good marks to get admission in the college. The eligibility criteria for the admission is 60% in class 12th and online registration. College has criteria of 65% above scored in 12th. Yes, you should score 60% on exams. 60% in class 12th and direct online form. JEE MAIN SAJEE 360 rank for each branch. There is an entrance exam to get the admission in this college. I appeared in JEE MAIN for the admission and the cut-off mark was 50. It’s good among all other private colleges. I took direct admission into this college (management seat). You need to give the entrance exams. We have a very good campus.